I found this post by my wonderful nutritionist Julie Rothenberg in Instagram this month. It struck a chord in me about awareness and helped me through a day on which I felt angry and aggravated. I really didn’t want to feel that way, so I thought about why this was happening – and I realised that on that particular busy day, what was missing was some valuable “me time”. I was rushing from one appointment to the next, and I didn’t factor in enough time to just sit and be. I remembered Julie’s post and her experience about having breakfast in a rush while standing up. Only by slowing down and spending time with ourselves can we actually listen to what we need. Thanks for the inspiration, Julie! This is such a fabulous product to get eye reflections! Easy to use & Highly recommended! My new friend and 3D content creator Biscuits was an inspiring force this month behind my latest 3D product SOUL REFLECTIONS for DAZ Studio. Her question lead to several new videos and something even more valuable: inspiration. Thanks for your support, Biscuits! It’s been a fun-packed month full of exciting discoveries – on and off the web. Let’s take a look at what I’ve found over the last four weeks. I was taking a late night walk after some heavy screen casting for those DAZ Studio videos, when I wandered by one of those restaurants South of Fifth in our neighbourhood (one that changes owners every 6 months or so). They were playing something that sounded almost live, and it immediately peaked may curiosity. Peter Mt. Shasta’s “Apprentice to the Masters”, part 2 of his autobiography (don’t judge it by its cover). How much will my Audiobook sell for via ACX? What needs to go in the Opening and Closing Credits for ACX Audio Books? I’ve re-discovered “The Modern Sound of Nicola Conte” this month. It’s a good soundtrack for writing. One of my favourites is the track Charade. It’s also been featured in the iconic Columbo episode, “Now you see him” with Jack Cassidy. Discovered (and purchased) the LEGO City Mountain Fugitives set at Walgreens for $9.99, my first LEGO set in over 35 years! A fan of my Commodore teachings, Stein-Ove Bratthammer, has a nice G+ page with some interesting BASIC programmes. Forum user Unseen has an interesting signature in the this forum post. I reverse-engineered it into my own Phrase Hunter project. And my final tech discovery this month, “new isn’t always better”. I already knew that. However it manifests in such contemporary facts like WordPress websites: PHP 7.2 is not compatible with many of my client’s websites. Instead, many still require PHP 5.6 or they simply won’t run. Website of artist Eric Budivitch, my first ever Patreon supporter! When I do research, I come across a plethora of interesting links on the internet. I always tell myself, “I really must remember this link”, but then I never write them down or add them to my bookmarks (believe, I’ve tried that once – only to find that my bookmarks were overflowing to a point in which I could no longer find what was really important). Then I came across a blog whose owner simply compiled a monthly “link dump” to paste anything he deemed interesting. I thought, what a cool idea is that, perhaps this could work for me and any discoveries too. In the past I once had a category on my other website just for links, and when there is something I’d rather not forget I tend to add it to my Twitter feed – but the trouble with those things is that I don’t do this with enough regularity for me to remember it as a notebook of where things are. A new category for discoveries seems to be right up my alley. 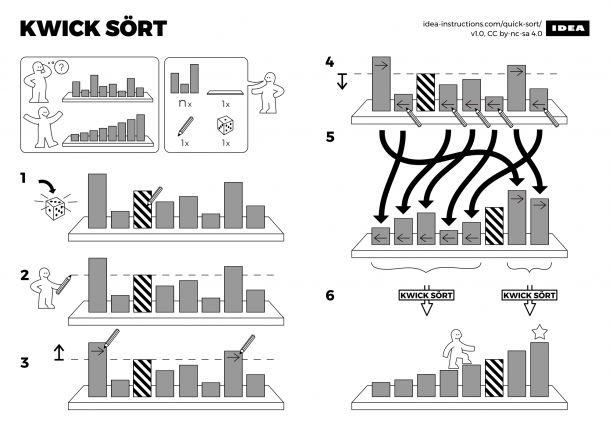 IDEA Instructions – a collection of IKEA-style comics that explain principles of computer science (such as Quick Sort). They even come with a template to create your own! To be continued – thank god for the shared history feature in Safari!